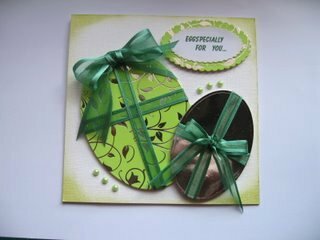 In other tutorials on the website we have made some Novelty shaped cards, just for the fun of it, and some specifically from circle punches, but now it's time to try some from oval shapes that you have in your crafty "Stash". Choose some bright, pretty card and an ink pad that will blend with them. I have used a good quality 255 gsm card for my project as this is sturdy enough for the card base to stand and also for the eggs to keep their shape. 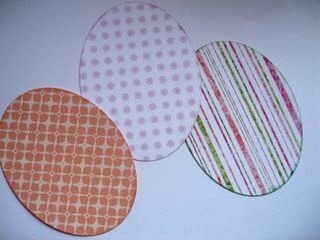 Create the ovals that you need from several patterned papers with large punches or dies. If you have different sizes of punches, die cuts or bought shapes then why not mix and match for a unique look to all of your cards. Once you have the shapes you need then you can arrange them as you wish onto your base card. 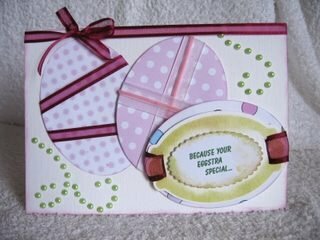 Both of these cards have had the eggs wrapped in some lovely organza ribbon and matching bows attached. I have added foam pads to the back of the eggs, and added them at different levels. This allows you to overlap them. The sentiments for both cards have been computer generated for ease and then I have layered them onto off cuts of the same card and added them with foam pads. The self adhesive flat backed pearls have been added to finish them off. But the real thing is much more comforting ... so give me the chocolate variety any day! !